This short biography of John Reed and Louise Bryant may well serve as a framework for seeing Warren Beatty's excellent film 'Reds' or for reading the former's exciting account of the early days of the Russian revolution, 'Ten Days that Shook the World'. It is not definitive, far from it, but it's a quick take on these two characters and their Bohemian subculture of the early 20th century.Other than reading 'Ten Days' en route by bus from Grinnell College in Iowa to the Moratorium Demonstration in D.C. my connection to these lives is that the conflict between the Communist Labor and the Communist Parties, described in both Reed's book and in Beatty's movie, was finally resolved alongside Lake Michigan, not far from the town of Bridgman and my paternal grandmother's cottage. Representatives of these two pro-Soviet splinters of the Socialist Party met there at the Wolff farm resort to resolve their differences, a task completed shortly before they were raided. Growing up spending summers there, however, I only met one person who knew of this epochal event: Ms. Roth, the town's first librarian. 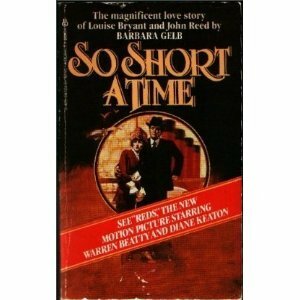 Great, nearly breathless tale of the vertices of a lovers' triangle" Reed, Louise Bryant, and Eugene O'Neill. Then, that triangle and the two key pieces of Louise and Reed land in the Communist Revolution and both die young, painfully and tragically for it. Much, much better than "On The Track Of Murder". Barbara Gelb - Barbara Gelb was an American author, playwright, and journalist. She, along with her husband Arthur Gelb, wrote three biographies of the Nobel laureate playwright Eugene O'Neill.